for his delicate touch and writing. Ken & Brad released Skipping Rocks, their second album, in September 2013. In its first month, it became the 4th most played recording on the Folk-DJ Charts. Their latest project “is both technically impressive and musically tasteful, a lovely exploration of both tradition and creativity (and of a warm musical relationship)." (CD Hotlist). 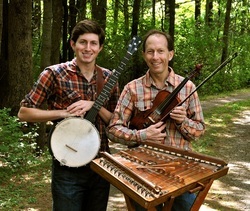 Concert appearances for the duo include The Kennedy Center, The Birchmere, The Champlain Valley Folk Festival, The Creative Alliance, three appearances at Helicon’s Winter Solstice concerts with Robin Bullock and Chris Norman, several appearances on the legendary “Bound for Glory” radio show in Ithaca, NY (the longest running live concert-radio broadcast in the United States), The Common Ground Festival in MD, The Mountain Arts Gathering in NY, The Folk Society of Greater Washington, The Baltimore Banjo Showcase as well as numerous other live radio broadcasts, concerts and festivals along the Eastern seaboard from North Carolina to Vermont to Wisconsin. Among Ken Kolodner’s many credits are a featured solo in an Emmy-nominated CBS-TV Christmas special, over a dozen recordings with sales well over 150,000, an “Indie” winner for Best Seasonal Recording in 1999, a #1 World Music title (Walking Stones) and bestseller for BMG (with over 55,000 copies sold), and numerous books and instructional recordings (including a book/CD on old time fiddling for Mel Bay and two books on playing the hammered dulcimer also for Mel Bay). Ken toured with the world music trio Helicon for over a decade and continued to tour as a soloist. He was the first and remains the only U.S. player to be invited to play at the International Hackbrett Festival in Germany along with the world’s best players. His extensive repertoire of thousands of pieces includes the traditional music from over 30 countries on all continents. Ken has performed in every state in the U.S. and teaches locally in Baltimore with over 75 fiddle and hammered dulcimer students. Music was not always in Ken’s vision. Kolodner graduated from Lawrence University in 1976 and a few years later pursued a career in public health, working on a PhD in epidemiology at The Johns Hopkins School of Public Health. While in grad school, he taught himself first to play the fiddle by listening to recordings. A few years later, he discovered the hammered dulcimer and quickly became recognized among a handful of the best in the U.S. Since completing his PhD at Hopkins, he has worked primarily as a musician (touring as many as 140 dates a year) but has continued to consult in public health, and has published widely with over 100 articles in medical journals. Skipping Rocks, Brad and Ken Kolodner with guests Alex Lacquement, Robin Bullock, Kagey Parish, and Elke Baker, Fenchurch Music 07, 2013. Otter Creek, Brad and Ken Kolodner with guests Paul Oorts and Elke Baker, Fenchurch Music 05, 2011. Out of the Wood, Ken Kolodner and Elke Baker with guests Eric Eid-Reiner and Brad Kolodner, Fenchurch Music 06, 2011. Creek may be a bit broader than your average old time stringband recording. 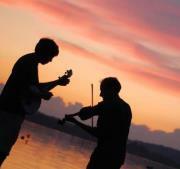 Otter Creek was the #1 most played instrumental recording on the Folk DJ-L and in the top 50 overall for 2011. Skipping Rocks was the 4th most played recording on the Folk DJ-L in the first month since its release in Octobert, 2013. “I received the album and have played tracks from it (you know I like it if I play it). As it happens, I'm closing next week's program with their music”. “It's a beautiful album! I played a couple of tracks on my String Fever bluegrass show last Thursday (Red Rocking Chair, The Orchard)”.